VizKey™ is the intuitive and easy-to-use software that combines database and interface for visual representation and analysis of large amounts of information. Relying on the adage “A picture is worth a thousand words”, VizKey™ offers the possibility to depict every piece of information by a graphical element: icon (object’s picture) or link (relation) between objects. Together with search and analysis functions, this simplifies the understanding of complex data and makes the determination of objects’ hidden relations, activities, and their significance in current situations much easier. Manually: by dragging and dropping icons on the chart area and defining links between them. It’s reasonable when you need to sketch an idea and the amount of information you have is not too big. Import large volumes of information from structured files. It makes life much easier: instead of spending much time on defining every object manually, you can transform a huge volume of information in a graphical format within a few minutes. Transfer information from multiple files into VizKey™, detect similar objects, merge them into one and you will see all implicit relations and activities much more clearly! Find and explore data from VizKey™ database(s). Using VizKey™ you will never have the problem of where to hold collected data and how to combine it with recently received information. VizKey™ database can be located on a server or a personal PC, be part of Oracle, MS SQL or My SQL database; it has no limits. Receive information on the VizKey™ chart area from external database(s). It doesn’t matter how information looks like in an external database, on VizKey™ chart you will see the picture composed by graphical elements. “Draw” the complex query by using object icons and relations, define conditions to searchable elements, check the result and show it on the chart. It’s not a problem where to store the collected information – VizKey™ offers a good solution to keep your data all together. 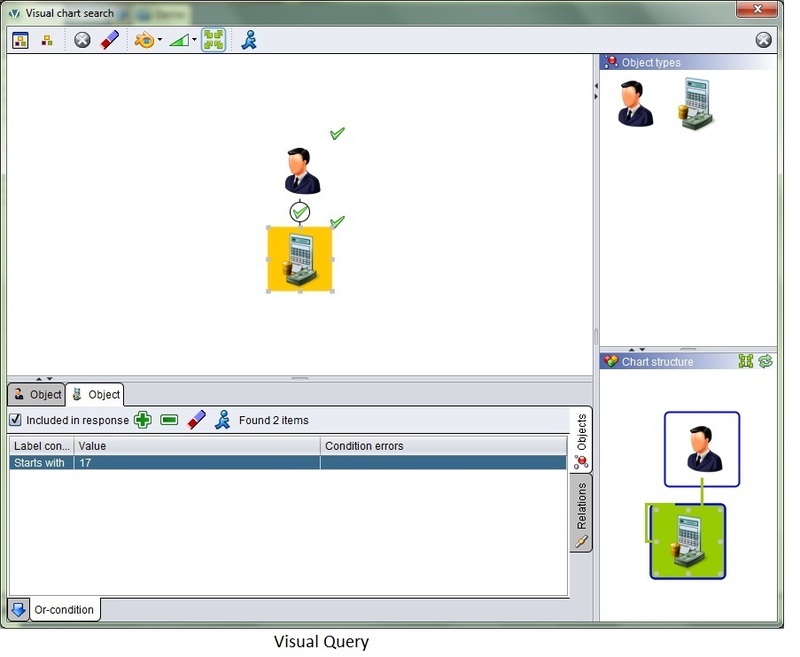 In VizKey™ you can define various databases with unique structures and for different purposes. Every database can contain multiple cases – happenings, tasks you work with etc; every case is like a folder for several charts – files with working information, ideas, hypothesis or results of investigation. Running VizKey™ for the first time you will be asked to create a database and define its structure: create object and relation types to represent information you most likely would work with. It’s simple enough even for an intermediate computer user. Add the General icon on the chart area like when creating a chart manually, name the object type(e.g. Person), choose a picture and add fields for data entry(Name, Last name, Date of Birth etc). When object types are ready, create relations between them and review the structure. To create chart and simultaneously save information into database, drag and drop the object type icon to VizKey™ chart area and enter information about a particular object. Populate chart with as many objects as needed. 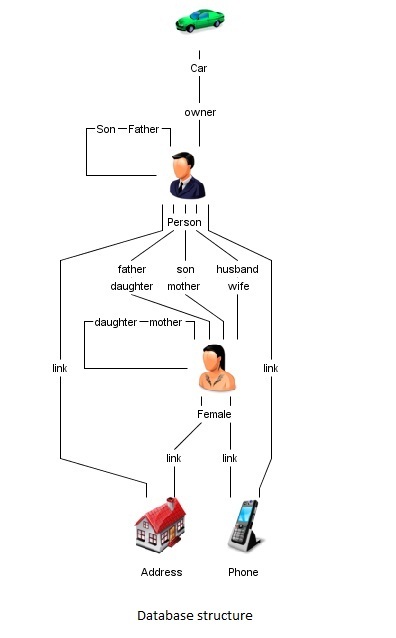 Draw a relation: two objects may have multiple relations and each of them can be described and saved into database. Every piece of information (e.g. address, meeting, conviction, sale, telephones and calls, bank accounts and transaction etc) can be depicted on the chart. You can get information on the chart manually by importing data from structured file(s) and from VizKey™ or external database(s). Combining those methods you can put together information from multiple sources and get more detailed and adequate overview of the situation. Collecting data together is not that big problem as what to do when the chart is looking like a tangle of lines and you are not able to follow up the connections from one object to another. VizKey™’s find and analysis functions will provide the great help in this situation. 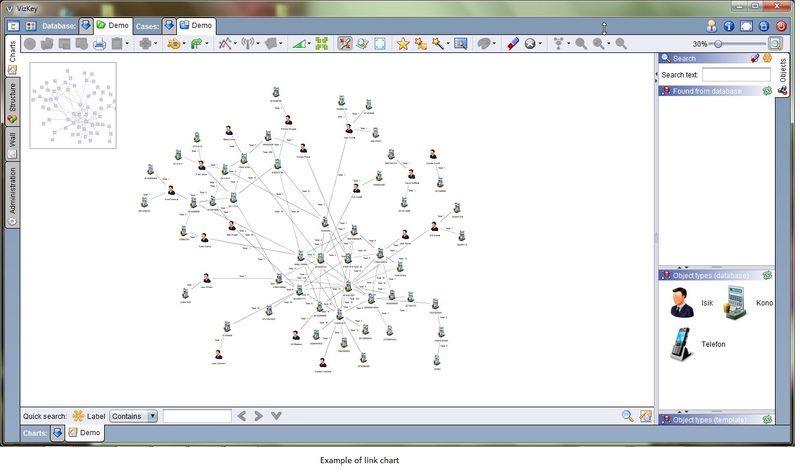 You can find and select object(s) of interest, find connected elements and path, define the importance of chart objects within a group or apply cluster analysis. Results can be copied to a new chart and saved for further work or representation to colleagues or chiefs. Import from structured files (CSV, TXT) is the easiest and the most time-saving way to add information on the chart or into database. Choose the file, enter the fields’ separator, and choose graphical elements to represent objects and relations on the chart or save them into database. Appoint the name of field(s) to particular object and relation and run import. Import takes only a few minutes or even less if you use a previously saved template, but the amount of information you receive on chart or database is significant. You can anytime supplement existing chart with information from VizKey™ database(s). Simple database search helps to find a single or multiple objects compliant with search criteria; complex database query gives out linked objects relevant to defined conditions. Most of VizKey™’s functions support information visualization and so does Visual Query. It is very similar to chart creation: drag and drop object and relation types, use AND/OR conditions, specify detailed search criteria and show the result on the chart. 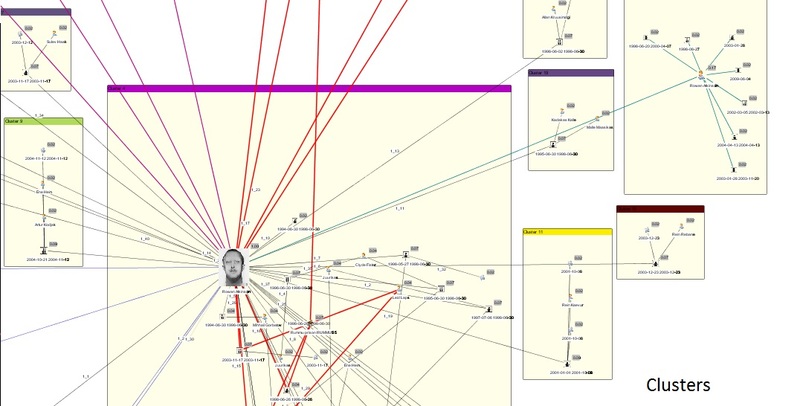 Once the object is depicted, Expand up to 5 levels extracts on the chart additional information about relations entered and stored in VizKey™ database. VizKey™ has built-in integration with Google Maps. Add objects to the map, define the location and copy coordinates into VizKey™ database or use a picture of the map as background image. From 8 layout types, choose the best for objects’ arrangement on the chart area. Some of the layouts are indispensable when it comes to relations(e.g. telephone call or social networks analysis), others simplify the understanding of organization structure or organize the representation of relations. You know that 2 certain objects are connected to each other indirectly, but can’t follow up all relations between them. Find Path ensures fast finding of the way from A to B, including all what is common for them. Sometimes it is very useful to find out what two selected Chart objects might have in common. 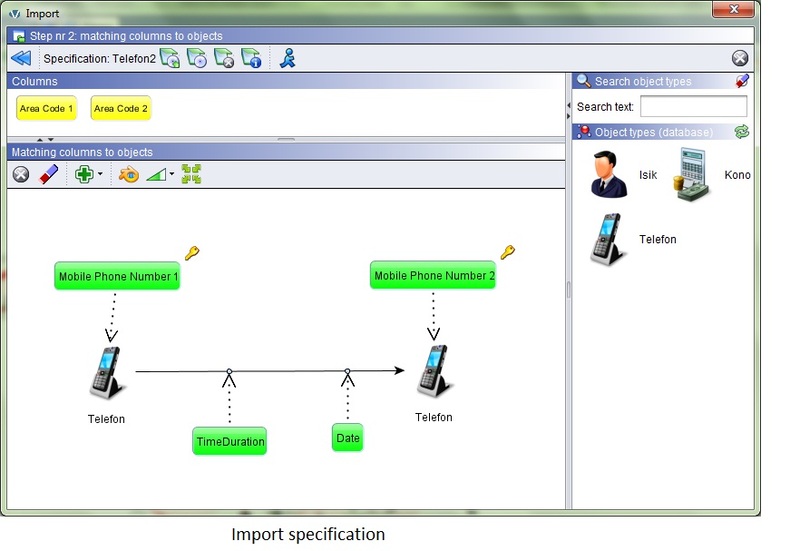 Select objects, click the button and the result will be highlighted on the chart. On the chart you have collected data from different sources and you are convinced that some objects are the same, but don’t know which ones. Merge function will find similar chart objects and let you apply necessary action: merge them into one, exclude an object from the group or exclude the group. Choose ignore special symbols or words in order to ensure finding of all similar objects. When merge is done, different fragments will be joined into one picture and you will see existing relations more clearly. Finding object(s) on the chart is simple: choose between 5 pre-defined conditions, enter the part or full text and hit search. Found chart objects will be highlighted and you can continue working with the result. Visual Search is another opportunity for related objects’ search. It is similar to Visual Query: draw the “picture”, define conditions and the result will be highlighted on the chart. Within the group of objects(e.g. social networks), some of them are more important than others. VizKey™ has the function that evaluates all chart elements and yields a double value for each object or each relation. This value directly denotes the chart element’s importance, i.e. the higher the value, the more important the element. When you need to find similar objects and assign them into group, use Cluster analysis function. 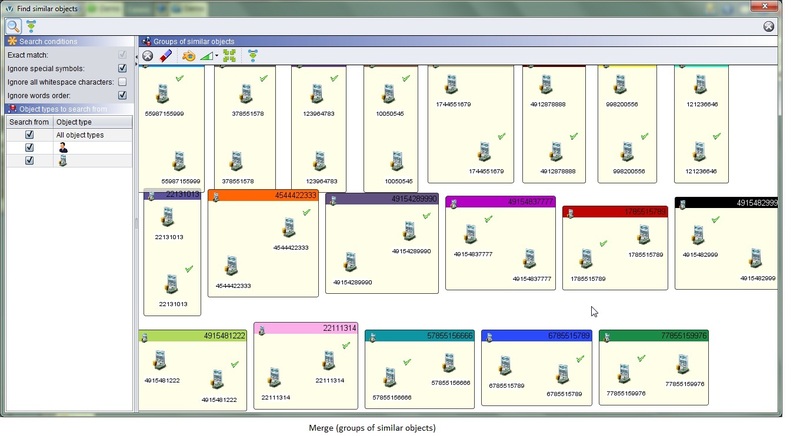 Objects grouped into the same cluster are more similar to each other than objects in different clusters. We described only some VizKey™’s capabilities; there are many other functions that make information representation and investigation more comprehensive and convenient. In case you have an interest in a more detailed description of VizKey™ Software, please do not hesitate to contact us at info@vizcase.com!